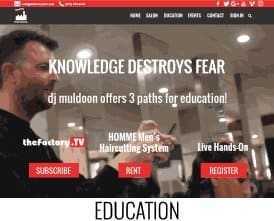 dj muldoon of theFactory Salon offers 3 paths for hair styling education. He offers video rentals, streaming subscriptions and hands-on training. I built his site to support all these paths. The site has a shopping cart to purchase DVDs and subscribe to the streaming videos. The videos are hosted on Vimeo which protects them from piracy. I built a registration system so that stylists could register for training. We recently added a short video to the home page.